It just so happens to be poncho' average fall day over here at Seams & Sprinkles! 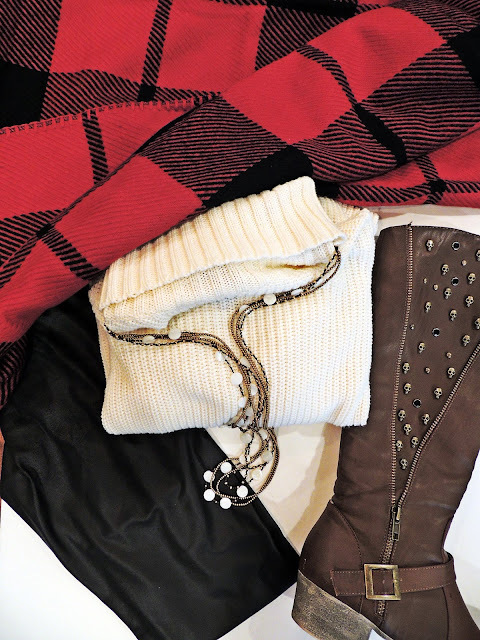 As the weather is slowly changing I have started to collect my new favorite layer accessories to stay warm and snuggly, and also have the option to let a little breeze flow in when it gets a little stuffy in there! Don't pretend that you are not sweating to death under that puffy vest (I know I always am)! This fashion truth is why I absolutely love layering to maintain the temperature I do so please. I think Goldilocks had the best idea when she tested out everything until it was "just right" and you can follow her lead by layering my friends! I thought the arrival of my new adorable and cozy poncho in the mail was the perfect time to showcase this piece with a favorite look around the town. It is always important to me to have pieces that can be multi-functional and also not cost a fortune! 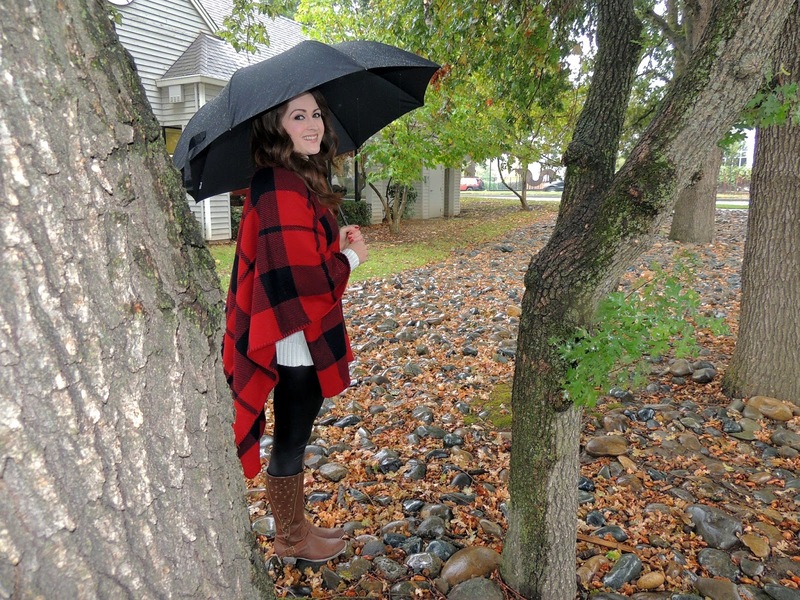 Are you ready to get this poncho' average fall day started? Well, let's go! 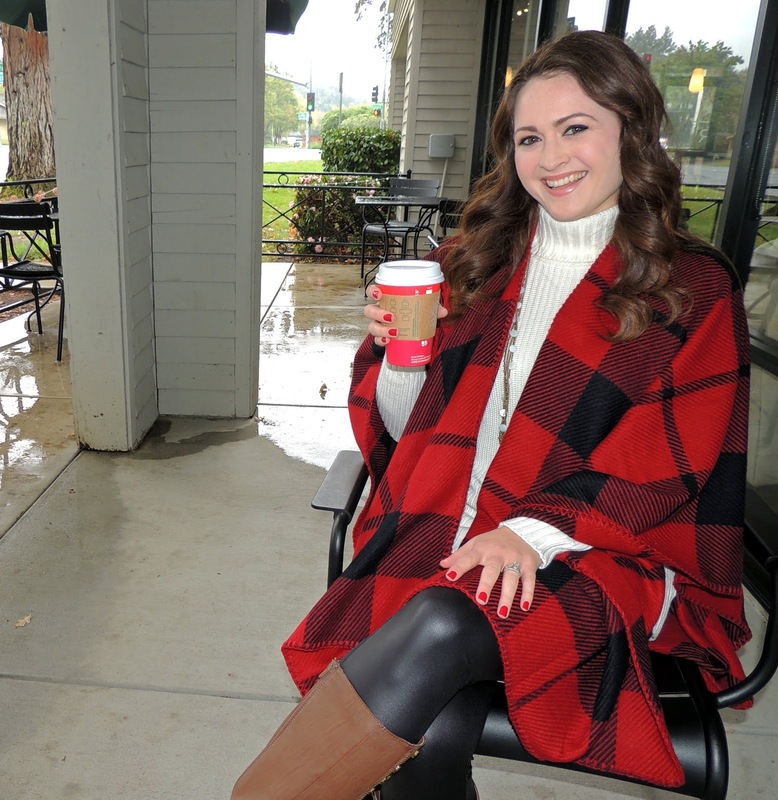 For this rainy Sunday morning around Sacramento, you first need your delicious coffee! My current holiday favorite is the Salted Caramel White Mocha from Starbucks- those sugary-salty-nomnomnom-sprinkles are to die for! So now that I have my coffee, we can talkie! For my first layer, I have paired these sleek yet simple pleather leggings with a cream turtleneck from Forever21. I added my favorite brown boots because they not only match with everything they also add that dash of sass with the gold skull studs on the side and although you can't see, I have kitty socks on underneath those... ME-WOW! I chose a longer gold and white layered necklace so it maintains its simplicity but also helps bring all the colors together. I then topped off the whole shindig with my wonderful and cozy new red and black plaid poncho from Zyania. I am keeping my makeup simple for this day to really let my outfit shine. I hope this helps generate some fun and sassy attire to showcase your own fall flare! Tell me all about your favorite places to get your layered looks in the comments below- I would love to try new places that you know are ah-maze-ing. Stay warm snuggly bears! I am loving the red! Fall has absolutely has the best clothes of any season. Thank you! Fall is my fave!